You know how it is, there is always an issue that occurs that stumps us for a time, it consumes us until we can resolve it. Well, here is one of those stump moments that has a resolution. There was a nagging issue where wireless connectivity was not consistent on the iPhones (5 and above), but wireless was good on other devices just not Apple devices (iPod, iPhone and iPad) on a new Linksys EA6900 Dual Channel router. The only thing in common was they were connecting at 5GHz which the laptops and other devices were not and issues were not happening. While doing a bit of digging came across several posts referring to a channel width setting of 80 MHz that is set by default on the 5GHz wireless. There was mention of this causing issues with Apple products and the Linksys EA6900 router and dropouts. There were several settings suggested for resolution, one of which was setting it to 20 MHz and another setting it to Auto, the later is the one that several users had changed to which resolved the issue, so that was where I was headed. So now that we have a direction, how do we resolve it and make the needed changes. Change “Channel width:” to “Auto” form 80 MHz. Final step is to disconnect the Apple devices and force them to re-attach them to the Router. Click on Device list from the screen and click on the “X” by each device to force a disconnect. 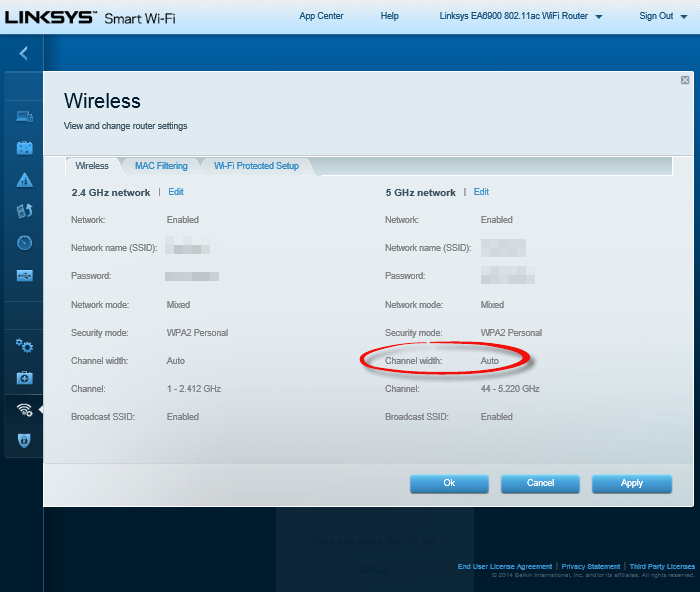 By changing the default channel width on 5GHz wireless the issue with wireless stability disappeared. Hope this helps you as it did me!